THIS STUNNING 9 YRS NEW ALL BRICK HOME WILL SURPRISE YOU. GOURMET EAT IN KIT OFFERS GRANITE CNTRTPS, ISLAND, SS APPLCS & 42" CABINETS. 1ST FLR FAMILY RM W/FRPLC. MSTR STE HAS WHIRLPOOL, SEP SHWR, GRANITE CNTRTP AND OVERSIZED WALK IN CLST. SPACIOUS RM SIZES. HDWD FLRING THRUOUT EXCEPT BDRMS W/ 9' CEILINGS. 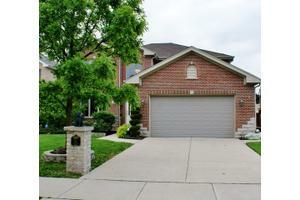 BEAUTIFULLY LANDSCAPED, SPRINKLER SYSTEMS AND FENCED YARD. TOO MUCH TOO LIST! YOU WILL NOT BE DISAPPOINTED.